This is the team working on the project funded by the USDA National Institute of Food and Agriculture. FAYETTEVILLE, Ark. – Marty Matlock will co-lead a strategic dialogue today regarding new efforts to enhance the productivity, resilience and sustainability of domestic fruit and vegetable supply chains. He joins many of the nation's leading agricultural and food companies at the Sustainable Agriculture Summit, held Nov. 15 and 16 in Kansas City. Matlock is the executive director of the University of Arkansas Office for Sustainability in the Fay Jones School of Architecture and Design and a professor in the Department of Biological and Agricultural Engineering in the College of Engineering. Americans are encouraged to eat more fruits and vegetables as part of a healthy, balanced diet, Matlock said. However, sustainably meeting increased demand for these highly nutritious foods will be challenging for domestic production regions in the United States due to many factors, including climate change, increased competition for labor, water and other natural resources. These supply chains are also undergoing significant innovation and transformation as a result of consumer preference for fresh produce grown locally, desires to improve sustainability profiles, and the rise of protected and urban production systems. About 500 diverse stakeholders from across the food and agricultural supply chains are attending the Sustainable Agriculture Summit, all gathered to discuss opportunities to advance continuous improvement in agricultural sustainability. Participants include farmers, suppliers, processors, manufacturers, retailers, academics, conservation groups and public sector representatives. Matlock, who holds a doctorate in biosystems engineering, organized the session with the Stewardship Index for Specialty Crops and the International Life Sciences Institute Research Foundation. The session chair is Dave Gustafson, who holds a doctorate in chemical engineering and represents the ILSI Research Foundation. Gustafson is co-leading a new four-year project funded by the USDA National Institute of Food and Agriculture — a project that includes Matlock and Greg Thoma, a professor in the Ralph E. Martin Department of Chemical Engineering at the U of A. They have partnered with the University of Florida, University of Illinois, Washington State University, International Food Policy Research Institute, and World Agricultural Economic and Environmental Services. 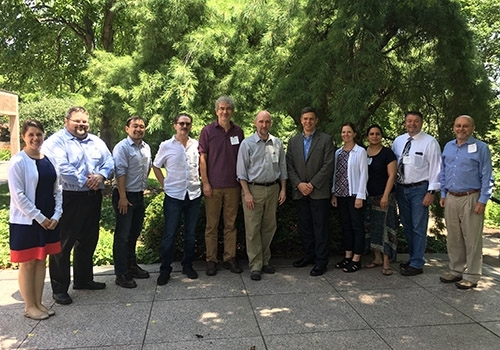 That project team is using various forms of modeling to study U.S. fruit and vegetable supply chains, with a focus on climate adaptation and mitigation opportunities for these crops. "The challenges we will face in the coming decades across the food supply chain are unprecedented in human history," Matlock said. "The participants in this strategic dialogue will help define priorities for scientists, policymakers, producers and the food supply chain to address these challenges. Together with our faculty partners across the U of A and our partner universities, we are leading the world in solving tomorrow's challenges today." About the Fay Jones School of Architecture and Design: The Fay Jones School of Architecture and Design at the University of Arkansas houses professional design programs of architecture, landscape architecture and interior design together with liberal studies programs. All of these programs combine studio design education with innovative teaching in history, theory, technology and urban design. A broad range of course offerings equips graduates with the knowledge and critical agility required to meet the challenges of designing for a changing world. Their training prepares students with critical frameworks for design thinking that also equip them to assume leadership roles in the profession and in their communities. The school's architecture program was ranked 26th in the nation, and the 12th best program among public, land-grant universities, in the 16th Annual Survey of America's Best Architecture and Design Schools, a study conducted in 2015 by the Design Futures Council and published in DesignIntelligence. For more information visit fayjones.uark.edu.